We found ourselves amidst Mad Men mania last night, at the Ace Hotel Theater in DTLA for the Mad Men Live Read and series finale event. Everywhere we looked we saw would-be Betty’s in glittering mini-dresses and wanna-be Don’s in super-slim grey suits, and the mood was one of mostly uncontrolled excitement as cast members strolled in on the red carpet. 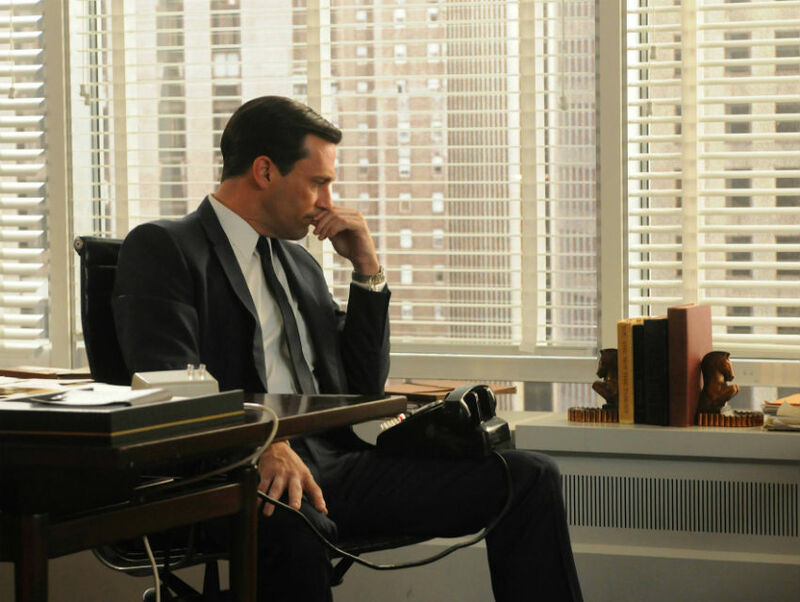 “There’s Don,” a Peggy-look-a-like squealed, and all heads swept to the left, as Jon Hamm, (with a pompadour!) ambled in with a grin. Other cast members in attendance included Kiernan Shipka, Elisabeth Moss, and John Slattery. It was a bittersweet evening for all, as the festivities, hosted by Film Independent and AMC, with KCRW’s Elvis Mitchell as emcee, got underway. First course was a cold read of “The Wheel,” the final episode of season one, in which Peggy got promoted to junior copy writer (and gave birth), Betty wrestled with the hard cold facts of Don’s adultery, and Don delivered the unforgettable pitch for the Kodak carousel. Jason Reitman, directing the live read, declared, “I say we lock the doors and don’t let Matthew Weiner out until he gives us a few more seasons.” With Colin Hanks playing Don and Fred Savage playing Pete, the live read was the perfect amuse bouche to prep us for the end of our favorite show. The final episode, “Person to Person,” starts with a montage of some heartbreaker moments: Betty holding infant Gene in her arms, the ghost of Bert Cooper disappearing behind a closed door, Don with tears in his eyes. Then we are literally zooming across a desert-scape with Don: apparently he’s a race-car driver now, or at least, a test-car-driver. “You’ve got to get that shimmy worked out,” he tells a couple of grease monkeys, as he climbs out of a souped-up coupe. Pretty soon, his heart is racing, rather than his car, as Sally delivers the news by phone that Betty has terminal cancer. “I’ve thought about this a lot more than you have,” she tells Don, before hanging up on him. It might be time to actually be a dad, Don. While the episode is dominated by Don’s story, the finale did wrap up the story lines for both Joan and Peggy to our satisfaction. We got worried at the opener, when Joan is in Key West doing blow with creepy boyfriend Richard, but before long she’s back in business in Manhattan, opening her own shop making industrial films (we don’t know what those are, but apparently you can make super-tall stacks of money. Go, Joan, go!) and saying so long to the creepy guy with the gold jewelry. Good riddance. And in Austen-like, even Shakespearean manner, Peggy’s story ends with marriage. Well, not marriage exactly, but the writing is on the wall. Stan tells Peggy, “Whenever I’m with you, I want to strangle you, but then all I want is to be with you. I’m in love with you.” And in perhaps one of television history’s most satisfying moments of perplexity, Peggy is rendered utterly speechless, until she finally blurts out, “I think I’m in love with you too.” They kiss, the crowd at the Ace Theater cheered, we sighed, and then we hit ourselves on the head. How did we not see this one coming? We are dense. And even though we know that Don does not exist and never did, this series ended so perfectly, with such style, and that is such a rare and lovely thing, that we really do feel like we are saying good-bye to people we knew. And we will miss them. Thank you, Matthew Weiner. Thank you very much. Oh, we forgot to mention Roger. He and Megan’s mom actually get married. And he’s leaving a lot of money to his kid with Joan. So he is a good guy, after all. Ken tells Joan that he needs her to do the industrial film thingy because his producer is “drunk as a skunk.” Now since when is that a criterion to fire someone on this show? We do get one last shot of Pete and Tammy and Trudy, as they board their Lear. Have a great flight! The moment we will never forget: Don saying, “People come and go and no one ever says good-bye.” Don, you get it. Now you finally get it. So, Don, here’s what we have to say to you: Good-bye, Don, you were the best. Good-bye! Next article5 Bands and Artists That Are Changing the Sound of L.A.